Submitted by Norm Roulet on Tue, 08/03/2010 - 10:45. 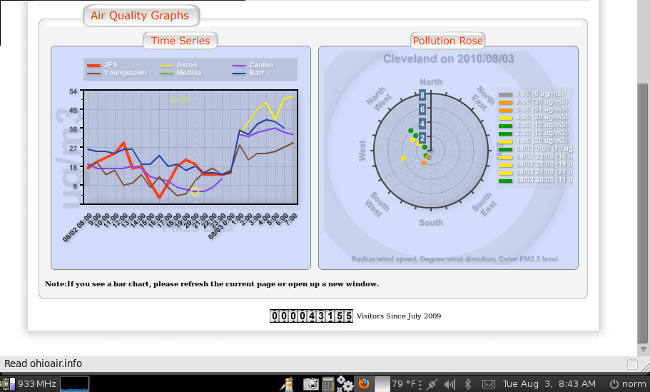 The NOACA Air Pollution Time Series line chart left above shows the region has had unsafe air quality since midnight, as per many monitoring stations - Cleveland is excluded from this chart but represented in the Rose Chart right above, which indicates the air in Cleveland was Unsafe at least at 5 and 6 AM, before they cut the data stream off.... meaning it is likely unsafe NOW. DO NOT TRUST THEIR DATA BEFORE 5 AM! 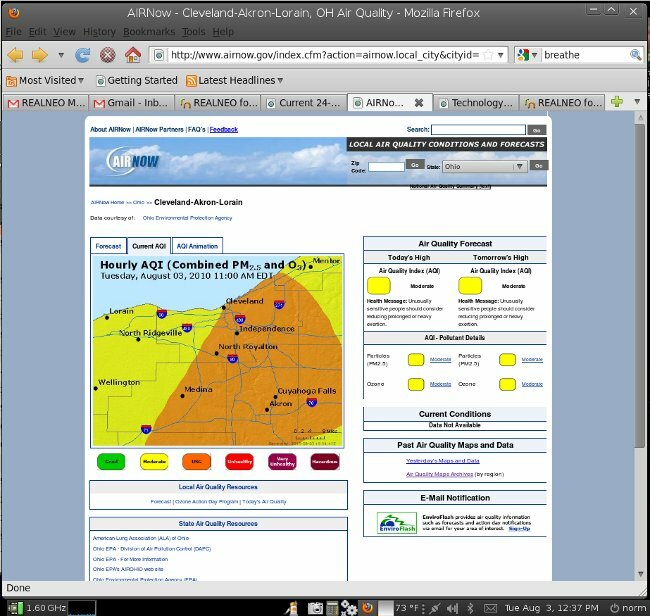 Right now - TUESDAY MORNING IN CLEVELAND AND ALL AROUND NORTHEAST OHIO - the air appears unsafe to breathe. According to data hidden throughout air quality monitoring reporting in the region, our air has been AT BEST UNSAFE FOR SENSITIVE GROUPS since MIDNIGHT. In other words... it is still UNSAFE from yesterday. Of course, the Ohio EPA forecast for today was "Moderate". The city of Cleveland, the Ohio EPA, NOACA, the leadership of multiple counties and cities, and even Senator Sherrod Brown, his staff and family, all appear not to care.... they appear intent to cause harm to citizens to benefit corporate interests. That is very short-sighted economic development strategy, benefittng few. and killing many more... actually, everyone living here! 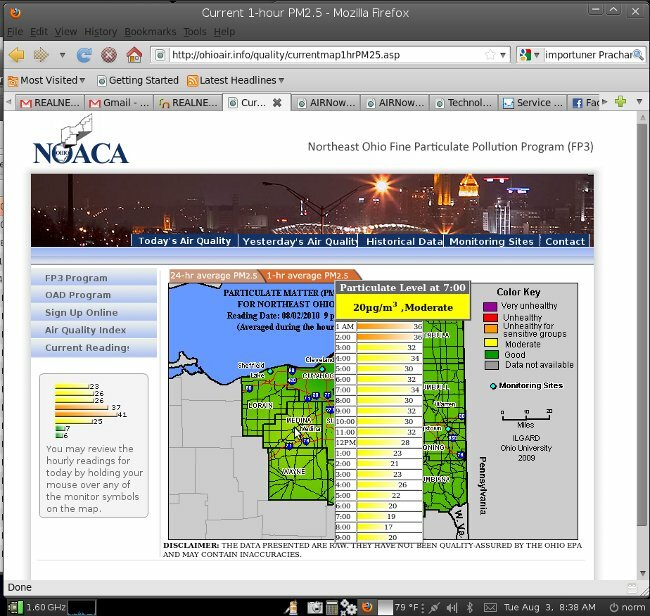 This NOACA Air Quality Chart for 7AM August 3, 2010, is so flawed, it shows the map reading for 9pm on August 02, 2010 (which was certainly wrong), and shows the current Cleveland pollution data table as "No Data". From the Rose Chart above, we know the monitor has been reading data (until shut off at 7am), it was Unsafe for Sensative Groups at Best at 6am, and this data is being hidden on purpose by human intervention. Evidence shows this pattern of deception has been our our statewide and local leaders ONLY air quality management strategy this decade. While obfuscated by poor use of technology and poor leadership in Ohio, the fragments of air monitoring data available around the region consistently show citizens are in danger every day, and no part of the region is ever really at all safe - this is the reading for Sheffield Lake as those citizens slept... perhaps with the windows open to enjoy the fresh Summer air... fools?! Don't Senator Brown and his wife live in this pollution? After raising these air pollution monitoring issue for years - escalating concerns to every level of government except the White House (until today) - and through now directly fighting polluters, including our Senator Brown's brother - I do not see a way to move the state of Ohio forward into a new economy without Federal EPA intervention into our air quality control here, as has been necessary in our peer state of Texas. 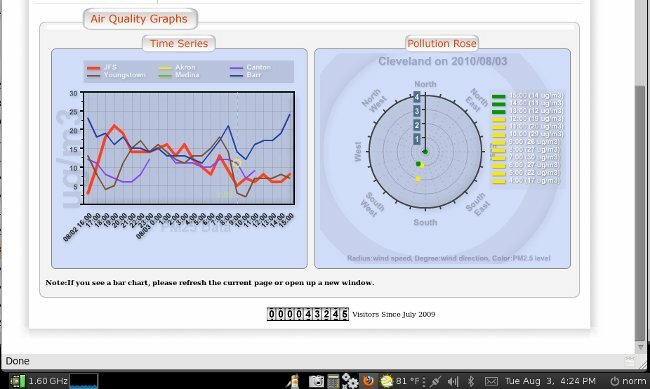 While the greatest environmental injustices in this region are clearly against inner city poor, even the affluent of Medina are impacted by air quality fraud - here we see the people of Medina have even worse air quality monitoring than in Cleveland today... this reading still shows pollution from August 02, 2010, broken at 9 pm, indicating that day started Unsafe there as well... I'm sure it is UNSAFE TODAY, but citizens will never know for sure. I'm now asking Senator Brown's office to escalate our air quality issues in Northeast Ohio beyond his office to the Federal EPA leadership level, directly, and I will expect responsiveness from the Federal EPA, as they work for President Obama. As in Texas, I believe it is necessary for the Federal EPA to take legal action against our local, regional and state air pollution regulating authorities, that have all failed or acted against the interests of citizens. If our local, regional and state air pollution regulating authorities have acted against citizen interests, rights and well being with intent, I expect criminal prosecution. I still have faith in President Obama. I have lost all faith in our local, regional and state leaders, as they seem intent to kill citizens, and uncaring of the process. And, as a result, the economy and citizens certainly suffer. 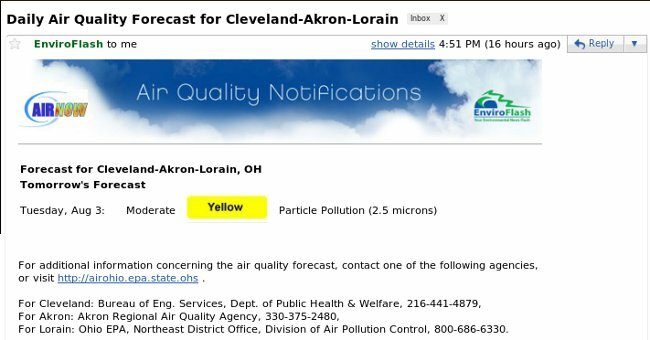 My wife was going to meet a friend with her kids and our kids for a fun morning at the Zoo - I told her not on their lives... Akron monitoring shows they are especially polluted south of Cleveland today and I am certain that is all from Cleveland, so the whole Cuyahoga River valley is filled with death today... shut the Zoo. When Cleveland nighttime pollution throws Canton off the safe chart, you know we are dead here in town! Leadership of the Painesville air pollution monitoring aren't sparing their local citizens any air pollution pain... they just ALWAYS DECEIVE THEM. See the "No Data" tables above and know Painesville is the partial RED line in the chart at the top of the page, which did have pollution readings yesterday, until 9PM... but not provided in a way helpful to those polluted. And here is the real reason why Youngstown's economy is coming back... they got rid of their steel mills and pollution and now their only problem is being near Cleveland, in Northeast Ohio, as they have the best air quality in the region, despite our poor performance here. Way too hot in Cleveland. Submitted by Norm Roulet on Tue, 08/03/2010 - 10:34. As today's air quality appear very poor, our air quality monitoring remains broken (worse than ever), and all local, regional and state government representatives appear uncaring, ineffective and unresponsive in addressing this crisis, please escalate my concerns and forward all my correspondence and requests of your office to an investigator at the U.S. Environmental Protection Agency concerned with National air quality. Please copy me, my wife and Mattie Reitman at the Sierra Club in your outreach, so we may follow up. If you have any questions, please email to schedule a time to talk. Submitted by Norm Roulet on Tue, 08/03/2010 - 12:20. I will not forget his pollution when I am gone. And we pay taxes for him. I suggest some of those still planning to die in the region inform John (email and phone above), Sherrod, Robert and Connie that air pollution crosses party lines, and ascends beyond petty politics. I think the Kennedy's would have known better. Submitted by Norm Roulet on Tue, 08/03/2010 - 11:14. 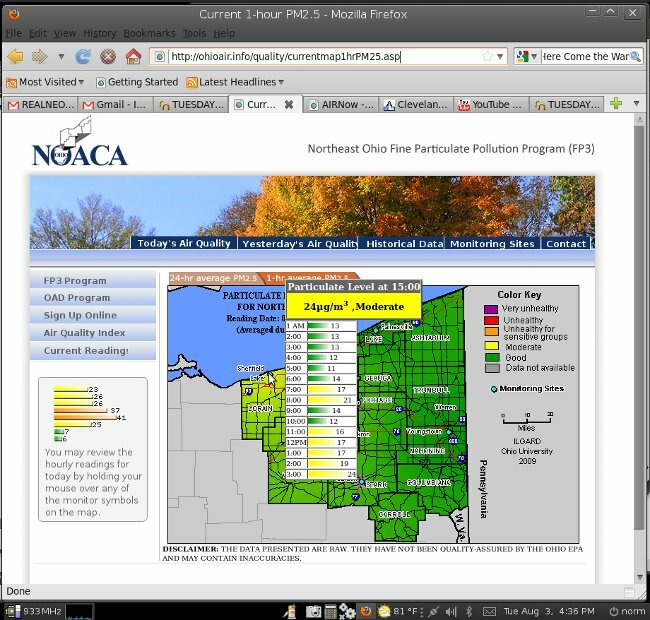 The wastes of tax-dollars at NOACA have "updated" our air pollution data for 9am and it shows conditions are as bad or worse than I expected - below is the useless but alarming report for Akron, reflecting serious pollution there but not the serious pollution to the North, which we Clevelanders certainly know comes from our Mittal and other coal burning source points here, no matter how our government leaders try to deceive us. Now it is drizzling, meaning while just as much pollution is entering the air as before much of it will be washed into our gardens, rainbarrels, groundwater, rivers, and lakes - and on our skin and in our food and water - making air pollution even worse by adding water and food contamination to the crimes here. As we are not expecting real rain, which might "wash" the air thoroughly into our water, I expect this drizzle will make the air pollution worse by thickening the air and holding more particulates in stagnation... so stay inside today, and wash your home-grown vegetables... if you feel safe eating local food at all! Submitted by Norm Roulet on Tue, 08/03/2010 - 11:34. Please escalate to thus to your National Sierra Club leadership and copy all of us on the correspondence - I am not satisfied with how any of this is proceeding. BTW - DO WE HAVE A LOCAL CHAPTER AND WHY? Submitted by Norm Roulet on Tue, 08/03/2010 - 12:55. Since the Democrats think pollution is about politics, I 've asked the Director of the Cuyahoga County Democratic Party to help me take this to her boss... who is Obama. Your people are too involved in politics to care about and address my concerns. I'm taking my concerns to the Federal EPA - will you help? Submitted by Keith Winston on Tue, 08/03/2010 - 13:32. Thanks Norm for the heads up . Submitted by Norm Roulet on Tue, 08/03/2010 - 13:46. 1301 E. 9th St., Suite 1710, Cleveland, OH 44114. Submitted by Norm Roulet on Tue, 08/03/2010 - 16:31. 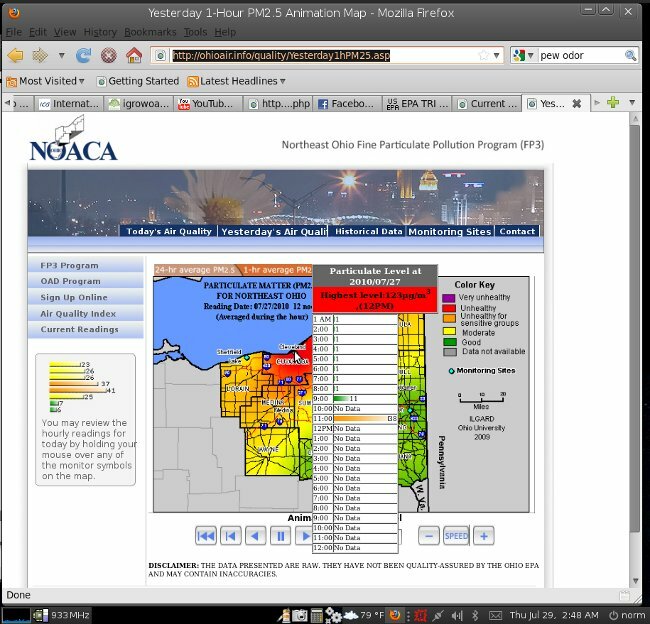 Go to http://ohioair.info/quality/currentmap1hrPM25.asp now and you will see they have stripped and rewritten all the data... like here... and voila we are "Moderate"
Submitted by Norm Roulet on Tue, 08/03/2010 - 16:54. You are the best judge of this - how sick have you felt today, and where did you wake up this morning? Didn't come to play teeball.